Multi-carrier (MC) transmission, in particular orthogonal frequency division multiplexing (OFDM), is employed in various systems mainly due to its robustness. With the deployment of WiMAX and LTE systems, research in OFDM hastened. In OFDM systems, smart antennae systems, with multiple transmit and receive antennae and location estimation, are critical areas of interest. In the recent years, adaptive antennae and array processing greatly impacted the performance of wireless communication systems. Also, location based services are gaining importance everyday increasing the need for better location estimation algorithms. In this project, we investigate one of the most essential issues of adaptive antenna systems: the estimation of angles of arrival (AOA) for OFDM systems and its utilization in location estimation and development of location based services. Our objective is to design location estimation methodology for obtaining location estimates with high resolution in MC systems. In our work, we use basis selection (BS) algorithms, namely the matching pursuit (MP) family of algorithms for AOA and location estimation, by exploiting the sparsity property of AOA for OFDM. The main advantages of applying BS algorithms to this estimation problem are the decreased complexity and increased resolution. When OFDM systems are compared to single carrier systems in terms of AOA estimation, the main advantage is that for each subcarrier, the received phase, depending on the angle of arrival, is different. This results is diversity in the angle of arrival equations. In this work, we also concentrate on the advantage of this diversity and its improvement on the accuracy of location estimation systems as well as the location based services that can be developed based on the obtained accuracy levels. Furthermore, we investigate the interaction between the location estimation block and higher layers of the communication systems. We concentrate on estimation performance optimization. A literature survey about application of sparse signal representation algorithms to communication systems for location estimation is completed for channel estimation and angle of arrival estimation algorithms. We have formulated the project problem definition and then proposed a novel location estimation system architecture. The proposed solution methodology makes use of the sparsity property of angle of arrivals of the received signals. This sparse signal decomposition based location estimation process for MC systems and the associated algorithms are detailed in the project deliverable reports. Greedy heuristic sparse signal decomposition algorithms are implemented and their performances are investigated. Additionally, tree search structures are integrated to these algorithms for performance enhancement. Two types of tree search structures are considered; namely breadth-first search and depth-first search. The performances of these algorithms are evaluated using a component detection experiment, where we showed that the tree-search structure can drastically improve the system performance while keeping computational complexity at reasonable levels. The corresponding C# codes for both the algorithms are generated to build a code library. Under this architecture, Matching Pursuit based algorithms are added to the toolbox. The toolbox is designed in such a fashion that is mainly utilized to evaluate performance of location based services, specifically the proximity based services (PBS). PBS are a subclass of location based services that aim to detect the closest point of interest by comparing relative position of a mobile user with a set of entities to be detected. Traditionally, the performances of PBS are measured based on the norm of the estimation error. Although this performance criterion is suitable for location based services that aim tracking applications, it does not give enough information about the performance of PBS. 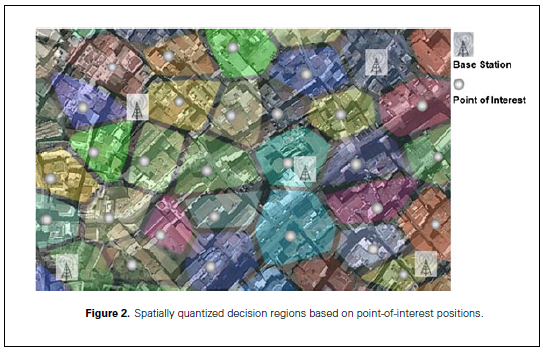 As an outcome of this project, a novel framework, quantifying the system performance of PBS by making use of spatially quantized decision regions that are determined according to service properties, is generated. The detection problem in PBS is modeled by an M-ary hypothesis test, and analytical expressions for correct detection, false alarm, and missed detection rates are derived. A relation between location estimation accuracy requirements that are mandated by regulatory organizations and the performance metrics of PBS is given. Additionally, a flexible cost expression that can be used to design high performance PBS is provided. A system deployment scenario is considered to demonstrate the results. By using this framework, PBS designers can improve their command on the services’ behavior and estimate service performance before deployment. Based on the technical outcomes of the REALMARS project, four PCT patent applications are filed. A journal paper is accepted for publication, and two conference papers are prepared and presented. In terms of the increase in the knowledge base of EU, improvement is achieved in two important areas: understanding of location based services and their quality, also, technical know-how related to implementing such services. 1. 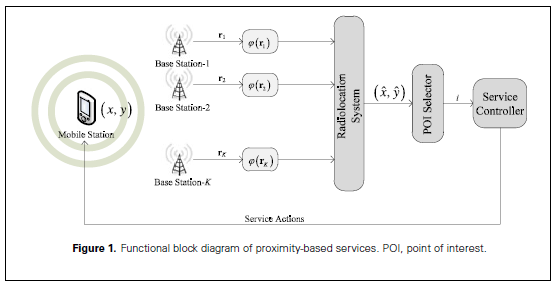 Güneş Karabulut Kurt, "On the Performance of Proximity-based Services", Wireless Communications and Mobile Computing, 2011, http://onlinelibrary.wiley.com/doi/10.1002/wcm.1187/abstract. 2. Saliha Büyükçorak, Güneş Karabulut Kurt, "Simulation and Measurement of Spatial Correlation in MIMO Systems with Ray Tracing", 12/2011, 5th International Conference on Signal Processing and Communication Systems, Honolulu, 12/12/2011 - 12/14/2011, http://ieeexplore.ieee.org/xpls/abs_all.jsp?arnumber=6140848 . 3. Enver Bahar, Güneş Karabulut Kurt, "Location Estimation in Multi-Carrier Systems Using Extended Kalman Based Interacting Multiple Model and Data Fusion", 07/2011, IEEE Symposium on Computers and Communications, Corfu, Greece, 6/28/2011 - 7/1/2011, http://ieeexplore.ieee.org/xpls/abs_all.jsp?arnumber=5983881. 4. Volkan Şenyuva, Emin Anarım, Güneş Karabulut Kurt, " Application of Barrier Algorithm in Signal Reconstruction via Compressive Sampling", 04/2011, SIU, Antalya, 4/20/2011 - 4/22/2011, http://ieeexplore.ieee.org/xpl/freeabs_all.jsp?arnumber=5929790, (in Turkish). 5. Güneş Karabulut Kurt, "Location Estimation by Basis Selection Algorithms", 07/2008, Wireless World Research Forum-21, Stockholm, 7/13/2008 - 7/15/2008. 1. G. Kurt, Angle of Arrival (Basis Selection) and Location Estimation System, PCT WO 2010/026503 A1, 2010..
2. G. Kurt, C. Şahin, A Location Estimation and Transmission Method, PCT WO 2010/070526 A1, 2010. .
3. G. Kurt, C. Şahin, Demodulation of OFDM QAM Signals with Channel Estimation Errors, PCT WO 2010/076699 A1, 2010. 4. G. Kurt, C. Şahin, Constellation Shaping for OFDM, PCT WO 2010/131125 A1, 2010.